Designed by Michael Graves, the Michael C. Carlos Museum offers an elegant atmosphere in an extraordinary setting. 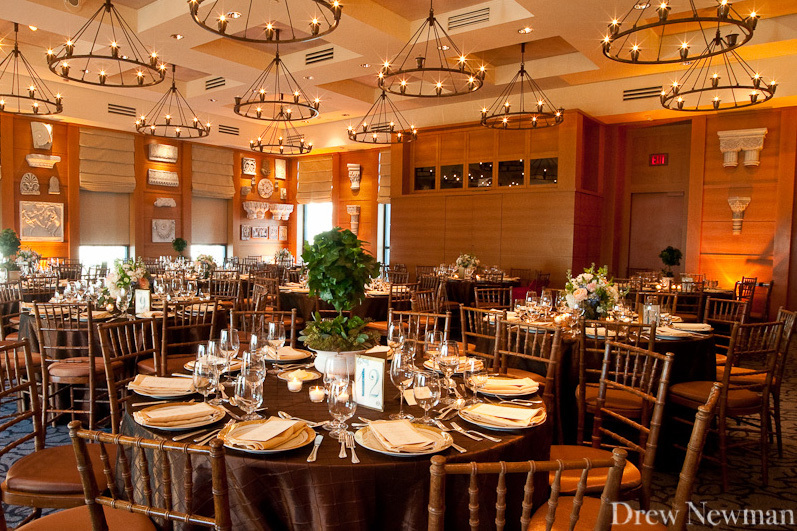 The Carlos Museum provides its guests an artistic and memorable backdrop for wedding receptions, rehearsal dinners, Bar and Bat Mitzvah celebrations, corporate meetings, and other special events. Event staff will help you choose which of the three rental spaces will best accommodate your needs. Room rental does not include admission to the galleries. With floor-to-ceiling windows looking out on the Emory Quadrangle, chandelier lighting, state-of-the-art audio-visual equipment, and a Steinway grand piano, Ackerman Hall is an ideal space for conference panels, wedding receptions, and awards dinners. Rental includes four hours of actual event time, two hours for pre-event catering setup, and one hour for post-event catering breakdown. The rental fee covers security, tables, chairs, use of the foyer, room setup, on-site staff member, and free parking after 5 PM and on the weekend. The foyer offers additional space that may be used for evening events such as a small dinner or cocktail party of 30 guests or fewer for which Ackerman Hall would be too large. Rental includes two hours of actual event time, one hour for pre-event catering setup, and one for post-event catering breakdown. Rental fee includes security, tables, chairs, setup, on-site staff member, and free parking after 5 PM and on the weekend. *Please note that if an event is scheduled in Ackerman Hall, the foyer space is not available. The wood-paneled board room is an impressive meeting space with state-of-the-art audio-visual equipment. Rental includes eight hours or any portion thereof of actual event time during the day and four hours of actual event time during the evening. Daytime and evening rental include one hour for pre-event catering setup and one hour for post-event catering breakdown. Rental fee includes security, on-site staff member, and free parking after 5 PM and on the weekend. The museum’s galleries may be added to any facility rental for an additional charge. Galleries will remain open for a maximum of two hours during that event. The galleries on Level One and Level Three may be rented for a fee of $500 each. Level One includes the galleries of Ancient Egyptian and Nubian art, the Morgens West Foundation Galleries of Ancient Near Eastern Art, Art of the Americas, Asian art, Greek and Roman art, and the John Howett Works on Paper Gallery. Subject to the exhibition schedule, Level Three includes the galleries of African art and special exhibition galleries (located directly across from Ackerman Hall). Select a caterer from a list of Atlanta’s finest chefs and event professionals. For an additional fee of $500, an outside caterer may be approved at the museum’s discretion. Outside caterers must be licensed, insured, and interviewed for approval. Restaurants are not considered caterers. Alcohol is permitted and must be provided by the event sponsor. There are no fees associated with alcohol, but a preferred caterer must provide all bartending services. Emory University does not allow alcohol sales on campus; cash/coupon bars are not permitted.